1. A [German] national is a person who enjoys the protection of the German Reich and who accordingly has specific obligations toward it. 2. The status of ‘German national’ is acquired in accordance with the provisions of the Reich’s Citizenship and Nationality Laws. 1. A citizen of the Reich is a German national who is of German or kindred blood only, and proves by his conduct that he is willing and fit to faithfully serve the German people and Reich. 3. A citizen of the Reich is the sole bearer of full political rights in accordance with the law. The Reich Minister of the Interior, in conjunction with the Deputy of the Führer, will issue the legal and administrative orders required to implement and complete this law. 1. Until further rules regarding citizenship papers are issued, all German nationals of German or kindred blood who had the right to vote in the Reichstag elections at the time the Citizenship Law came into effect shall for the time being have the rights of Reich citizens. The same shall be true of those to whom the Reich Minister of the Interior, in conjunction with the Deputy of the Führer, has given preliminary citizenship. 2. The Reich Minister of the Interior, in conjunction with the Deputy of the Führer, can withdraw this preliminary citizenship. 1. The regulations in Article 1 are also valid for Reich subjects of mixed Jewish blood. 2. An individual of mixed Jewish blood is one who is descended from one or two grandparents who were racially full Jews, insofar as he or she does not count as a Jew according to Article 5, paragraph 2. A grandparent shall be considered full-blooded if he or she belonged to the Jewish religious community. Only a citizen of the the Reich, as the holder of full political rights, can exercise the right to vote in political affairs or can hold public office. The Reich Minister of the Interior, or any agency empowered by him, can make exceptions during the transition period, with regard to occupation of public office. The affairs of religious organizations will not be affected. 2. Jewish officials will retire as of 31 December 1935. If these officials served at the front in the World War, either for Germany or her allies, they will receive in full, until they reach the age limit, the pension to which they were entitled according to the salary they last received; they will, however, not advance in seniority. After reaching the age limit, their pensions will be calculated anew, according to the salary last received, on the basis of which their pension was computed. 1. A Jew is anyone who is descended from at least three grandparents who are racially full Jews. Article 2, para. 2, second sentence will apply. 2. A Jew is also one who is descended from two full Jewish grandparents, if he or she (a) belonged to the Jewish religious community at the time this law was issued, or joined the community later, (b) was married to a Jewish person at the time the law was issued, or married one subsequently, (c) is the offspring of a marriage with a Jew, in the sense of Section I, which was contracted after the Law for the Protection of German Blood and German Honor became effective, (d) is the offspring of an extramarital relationship with a Jew, according to Section I, and will be born out of wedlock after 31 July 1936. 1. Requirements for the pureness of blood as laid down in Reich Law or in orders of the NSDAP and its offices – not covered in Article 5 – will not be affected. 2. Any exceptions to the rules for the pureness of blood not covered in Article 5 can be made only by permission of the Reich Minister of the Interior and the Deputy Führer. 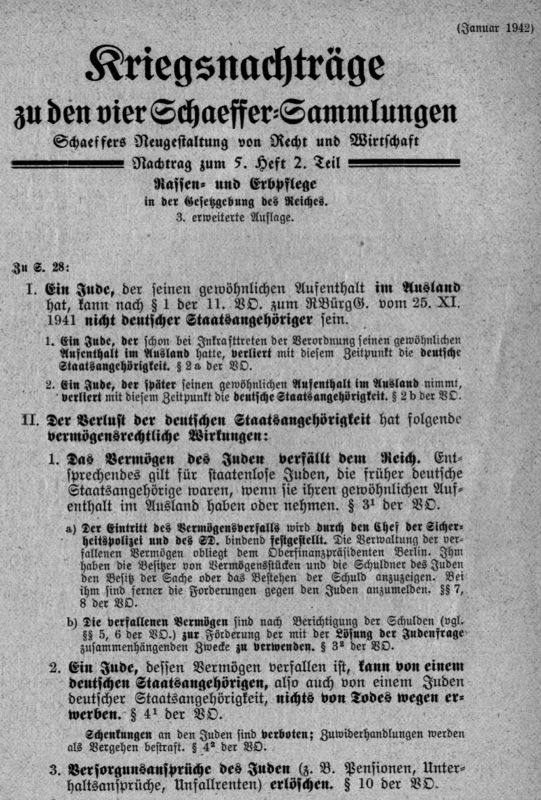 If any such applications have been made, they will be void as of 1 January 1936 if they have not been acted on by the Reich Minister of the Interior in agreement with the Deputy Führer. Such applications must be made to the Reich Minister of the Interior. 1. Marriages between Jews and citizens of German or kindred blood are forbidden. Any such marriages are invalid, even if concluded abroad to circumvent this law. Extramarital relations between Jews and citizens of German or kindred blood are forbidden. Jews may not employ in their households female citizens of German or kindred blood who are under 45 years old. 1. Jews are forbidden to fly the Reich flag or national flag or display Reich colors. The law takes effect on the day following promulgation, except for Article 3, which goes into force on 1. January 1936. 1. ‘National’ means ‘German national’ when referred to in the Reich Citizenship Law.